I have been a fan of Stewart’s books since the moment I picked my first one up, called ‘Unworthy’. I have been busy catching up on his other books and I can honestly say that I have loved each and every book of the Smith series that I have had the pleasure of reading. I have just finished reading ‘Horsemen’ and I absolutely loved it but more about that in a bit. What can I say about Detective Jason Smith? Well, he is an Australian by birth but he was sent over to England to live with his grandmother after his sister disappeared. Smith carries an awful lot of guilt around with him and nobody could blame him more than he blames himself. He and his grandmother shared a very tight bond and it was almost as if she took on the role of ‘Mother’ as well as ‘Grandmother’. Smith’s relationship with his birth parents is somewhat strained. Smith did start off studying for a law degree but he changed his mind and became a policeman instead. He is incredibly clever, he has a keen gut instinct which is uncannily accurate and like a Mountie, he always gets his man. He isn’t averse to bending the rules slightly and to say that he pushes his luck on occasion is a huge understatement. Smith doesn’t seem to have a filter either and often speaks before he thinks, but he doesn’t give two hoots. Smith is popular with most of his colleagues but he does have his enemies too and again he doesn’t give two hoots about what others think of him. In ‘Horsemen’, Smith is fast approaching burn out stage after investigating some pretty intense and difficult cases. Smith is desperate to take a holiday and insists on taking it immediately. His superiors panic and agree that if he can crack the case of the armed robberies then he can have his leave. Smith regains his appetite for his work. This book sees a bit of a happier Smith, as he is in a relationship with a female colleague, although she is not too happy at the fact that he wants to disappear on his own for the fortnight. Smith doesn’t need to find cases as cases have an uncanny habit of finding him. Even on his holidays, he gets roped in to solving crimes. Oh my goodness gracious me, ‘Horsemen’ is one seriously, stonkingly well written and fantastic book. The author certainly knows how to grab your attention from the start and much like a hypnotist, he keeps you under the book’s spell until the moment you close the back cover. I certainly felt as though I was in a trance. The story certainly starts with a bang and it maintains the pace throughout. I became addicted to reading ‘Horsemen’. My Kindle wasn’t exactly glued to my hand but it might as well have been because it came everywhere with me. I just couldn’t put it down. The more I read, the more I wanted to read, the more I got into the story and the quicker those pages turned. In fact at one point, the pages were turning that quickly that it was almost as if they were turning themselves and I finished the book far quicker than I had intended. I desperately tried to ration how much I read in one go because I wanted to prolong my enjoyment of the book but my intention flew out of the window. 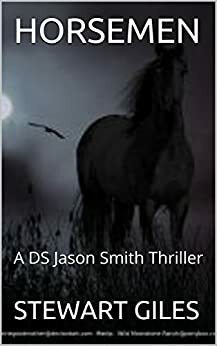 Where this book slightly deviates from the others, is the fact that DS Jason Smith is on his own investigating the murder and he doesn’t have the backup of his girlfriend or his team. Reading ‘Horsemen’ was much like riding on a very scary and unpredictable rollercoaster ride with not much of an idea as to which direction the story will be taking next. There were times when I dreaded having to turn the pages as I feared what was going to happen next but then of course if I wanted to know what happened next then of course I would have to read on. In short I absolutely ADORED reading ‘Horsemen’, which is right up there on my top ten favourite reads of 2018. Stewart Giles is also up there on my list of favourite and must read authors. The series featuring DS Jason Smith just goes from strength to strength. I would definitely recommend Stewart and his books to other readers. His books are gripping and often chilling and the stories are fast paced. I can’t wait to read what he comes up with next. The score on the Ginger Book Geek board is a very well deserved 5* out of 5*.